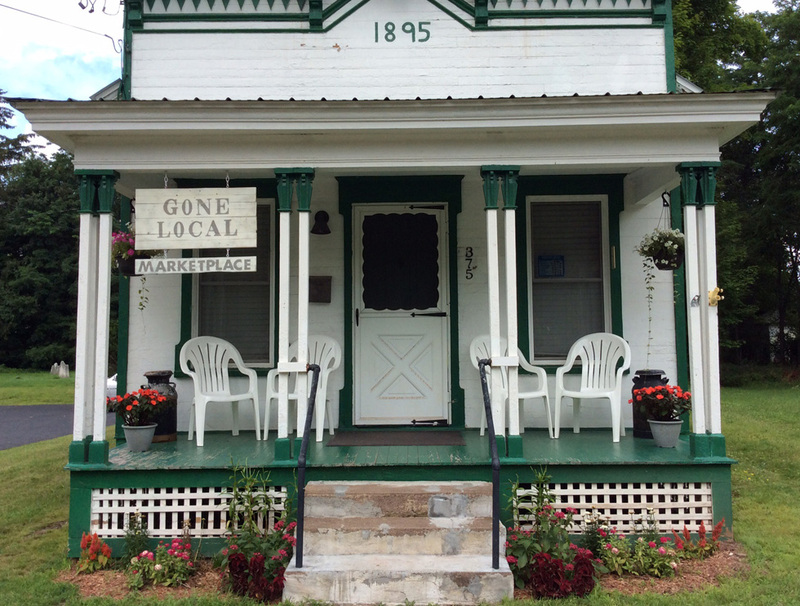 New in Franklin: Gone Local Marketplace Brings Catskill Groceries to Main St.
Delaware County couple Leah and Kurt Schmidt had a long love affair with an 1895 building on Franklin’s Main Street. When the opportunity to lease the former law office that, local legend says, was built as a home for a Civil War veteran, they jumped at the chance to launch a new venture. Saturday, they welcomed their first customers to Gone Local Marketplace, a grocery store and ice cream parlor specializing in Catskill-area products. The ice cream is from Jane’s Ice Cream out of Kingston. There’s milk and yogurt from Cowbella in Jefferson, veal from Walton’s Edmar Farm, Northern Farmhouse Pasta from Roscoe, Jamaican jerk sauce from Baron’s International Kitchen in Hurley and chanterelle mushrooms foraged in Sidney Center. “We’re building the inventory a little bit, every day,” Kurt said, noting that an official grand opening is scheduled for the end of the month. They are still seeking new food products made locally, including jams, jellies and sauces, and would also like to add sundries and general household goods, such as blankets. Kurt, who’s from Walton, and Leah, who grew up in Delhi, wanted to bring local farm products to a new neighborhood gathering place. The inspiration came partly from the business model of the Honest Weight Food Co-op in Albany, Kurt Schmidt said. “We need, as a community, to really connect with our farmers and our producers, whether it’s squash or barbecue sauce,” he said. 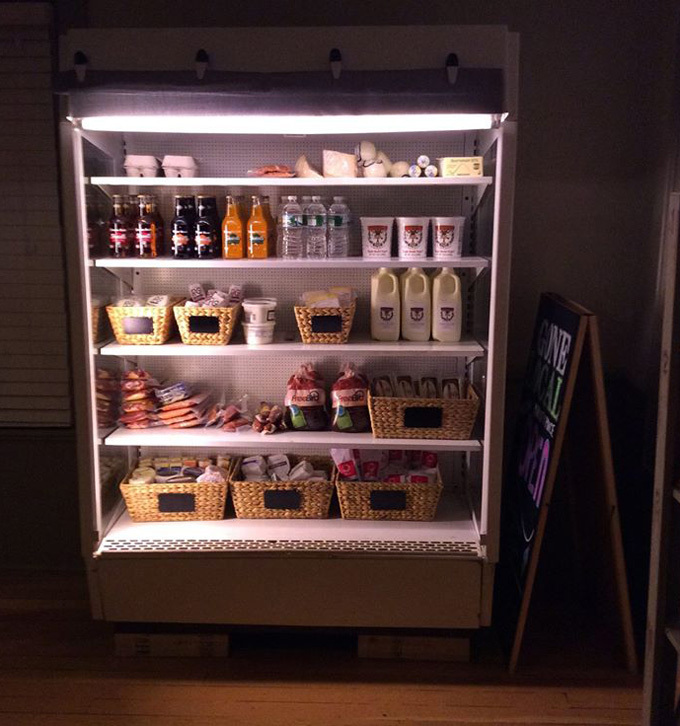 In addition to ice cream and a growing grocery supply, the market also features three or four grab-and-go sandwiches each day, all based on seasonal components grown or made nearby. Opening weekend offerings included a fresh mozzarella, tomato and basil sandwich and a banh mi with roasted pork shoulder, cucumbers and pea shoots. If all goes according to plan, Gone Local will eventually host small community events and, next year, will expand to offer weekend barbecues fueled by Kurt Schmidt’s hobby of curing, smoking and corning meat and poultry. Kurt Schmidt has a long background in the food industry. After studying culinary arts and hotel/restaurant management at Johnson & Wales University, he worked as a chef in various upstate locations, including an Albany country club and a stint as a corporate chef for Cooperstown railroad magnate Walter Rich. He currently works at Adventure in Food, a Capital Region wholesaler that specializes in gourmet foods such as imported and domestic cheese, exotic game, all-natural farmed meat and high-end prepared foods. He has sprinkled a few of his favorite non-local offerings from Adventure in Food–elk sausage, for example–into the store’s freezers, just to pique shoppers’ interests. For now, Leah will run the day to day operations and Kurt plans to keep his day job, but the Schmidts have big plans for the future if this model succeeds. 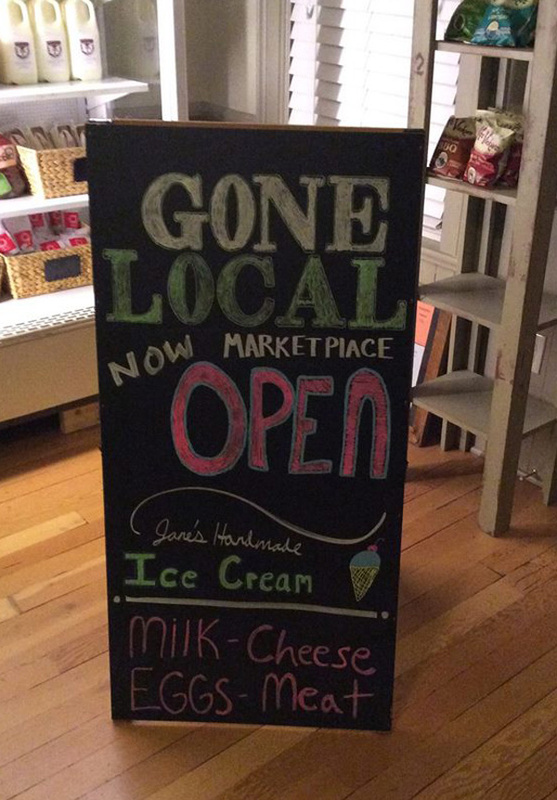 Find Gone Local Marketplace at 375 Main St., Franklin, and on Facebook. Current hours are Tuesday through Saturday, 10 a.m. to 6 p.m., and Sunday 1 to 6 p.m.
1 Comment on New in Franklin: Gone Local Marketplace Brings Catskill Groceries to Main St.
We love having Gone Local here in Franklin. Leah and Kurt have down a wonderful job!